According to Zillow, home prices increased 4.9 percent year-over-year. There are 3.4 percent fewer homes available now than last year. 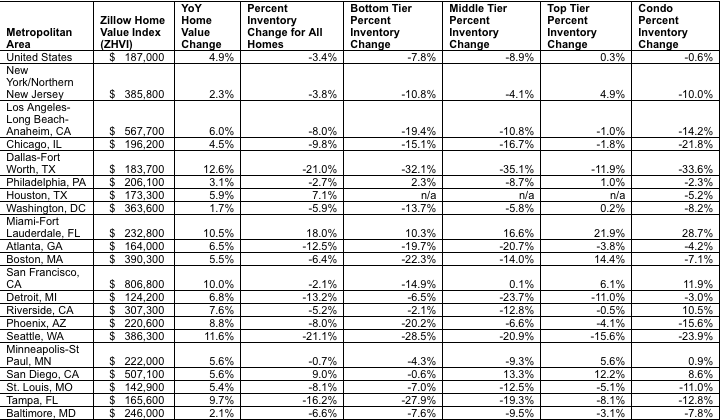 Portland, Oregon had the greatest change in inventory, with levels stooping 31.6 percent since last year. Zillow’s announcement that national home values increased 4.9 percent comes on the heels of similar data from Federal Housing Finance Agency (FHFA), which reported a 5.7 percent increase in home prices. Both reports came to the same conclusion: The increase in prices and shrinking inventory are making it difficult for single-family home buyers in the middle and lower brackets. The Zillow Home Value Index (ZHVI), which bases its findings on given geographic locations and asking price (not price paid), determined the median home value in America to be $187,000. The increase in home price is one result of a growing job market and low mortgage rates, both of which lead more people to consider buy homes. Inventory has steadily declined due to lack of new construction in the single-family home sector, but condo and luxury real estate is booming thanks to commercial developments in major markets. However, with the unemployment rate leveling out around a healthy 5 percent, new homebuyers are facing struggles in acquiring property. Unsurprisingly, the markets with the highest median home values according to the ZHVI are all in California. San Francisco and San Jose’s median home values clear $800,000, while San Diego and Los Angeles easily glide north of $500,000. But the low inventory California is experiencing could forecast a hyperlocal boom in new construction. All major markets in California saw more than 6 percent year-over-year growth in median home values. Prices seem to be a bit more comfortable in Texas. Median home values in Houston remain slightly below the national average at $173,300, with home appreciation at 5.9 percent. Austin’s median home value is significantly higher at $250,400, and the city is enjoying a home appreciation of 8.9 percent. The Windy City is on the right path with new construction on the horizon and high-rises sprouting up throughout Chicago. The city’s median home value is just over the national level at $196,200, and home value has increased 4.5 percent annually. New York City home values increased 2.3 percent, and the median home value in the NYC metro area is $387,800. Home values in Baltimore and Washington, D.C., increased 2.1 percent and 1.3 percent, respectively. The District’s median home values top $363,600, and sellers in the area are getting 99 percent of asking price. Miami’s increase in home value is a startling 10.3 percent. Although median home values in the nightlife mecca already have a comfortable median of $232,800, new construction in mixed-use and residential properties are pushing the values up.